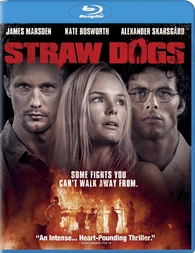 James Marsden and Kate Bosworth will be terrorized by Alexander Skarsgård on Blu-ray in December. In an early announcement to retailers, Sony has revealed 'Straw Dogs (2011)' is headed for Blu-ray on December 20. The film is a remake of Sam Peckinpah's 1971 edge-of-your-seat thriller loosely based on Gordon Williams' novel, The Siege of Trencher's Farm. The Blu-ray will feature 1080p video, a DTS-HD Master Audio 5.1 soundtrack, and supplements include: Commentary with writer/director Rod Lurie, Courting Controversy: Remaking a Classic, The Dynamics of Power: The Ensemble, Inside the Siege: The Ultimate Showdown, and Creating the Sumner House: The Production Design. You can find the latest specs for 'Straw Dogs (2011)' linked from our Blu-ray Release Schedule, where it is indexed under December 20.